That’s me. Right now, I’m extremely overwhelmed. We are leaving in a few hours and I have a house full of clean clothes and that’s about it. I have a few lists scattered here and there, but all is not lost forever. I finally organized my Camping Packing List just for tent or travel camping. 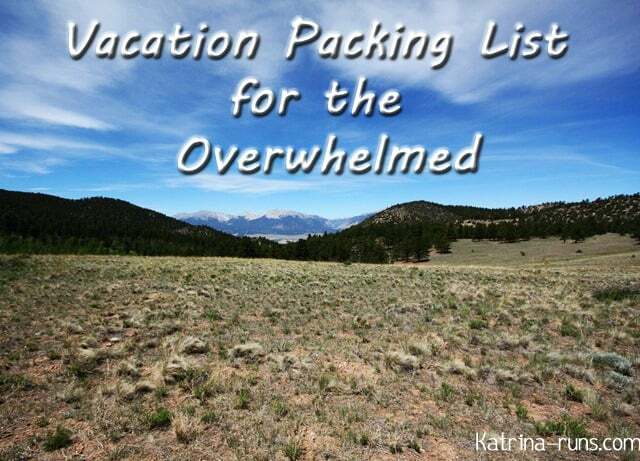 Now all I need is a general vacation packing list to use when we travel to races or family vacations and stay in hotels, cabins, or condos. For camping vacations, I will use both of these lists. One note: When I travel, I usually have 3 bags of various size: Clothing, Racing, and Tech gizmo. For longer trips than a 2 night weekend, I have a Miscellaneous basket in the backseat with easy-to-grab stuff of all varieties. I listed those below, as well. Underwear. I strongly encourage wicking fabrics. Post race clothing: sweatshirt and sleep pants/yoga pants and flip flops. Camera SD cards. Keep extras. Nothing kills the magic more than a dead battery and full card. Bug repellent in the form of 2 things: Avon Skin So Soft and Neutrogena Body Oil. Both of these are excellent bug repellents and smell better than Deet. Major cash for bail money or out-of-state speeding tickets. I’m not laughing. On our honeymoon, we got a speeding ticket. We had to cough up cash right there on the side of the road in Michigan. A lot of cash. Most of our travel cash. I’m still not over it, apparently. Any other ideas I left off? I will add to it as I pack for Colorado 2013! !